This recipe is not Paleo. It is grain, gluten and refined sugar-free. And…it is absolutely indulgent, delicious and perfect for special occasions. Preheat oven to 350. Lightly grease a pizza pan or line with parchment paper. Mix all dry ingredients, then add in the wet ingredients. Blend ingredients with a hand mixer until smooth. Press dough into the pizza pan. Bake in oven for 10-12 minutes, until slightly golden brown. Remove from oven to cooling rack, cool completely before topping. Using a mixer, blend ingredients together until smooth. These fruits are my favorite to use, kiwi is a popular choice as well. Feel free to use your favorites…keep in mind that bananas might get brown and mushy! In a small saucepan, whisk together ingredients and bring to a low boil over medium heat. Stirring constantly, boil for 2 full minutes and then remove from heat to cool. Once the crust is cooled spread the cream cheese filling over the entire crust. Arrange fruit as you please on top of the cream cheese. Drizzle generously with the glaze. Chill uncovered in the refrigerator until ready to serve. Cut with a pizza cutter into slices and enjoy! You can use any sugar cookie recipe to fit your dietary needs. This dessert will store in the refrigerator for up to two days, after that the crust may start to get mushy. It may be yummy with a drizzle of chocolate or even a brownie type crust! What a lovely dessert, it looks fantastic. this looks so tasty. Yum yum yum! And I love that it doesn’t have refined sugar! What a beautiful pizza and that too grain free and refined sugar free. 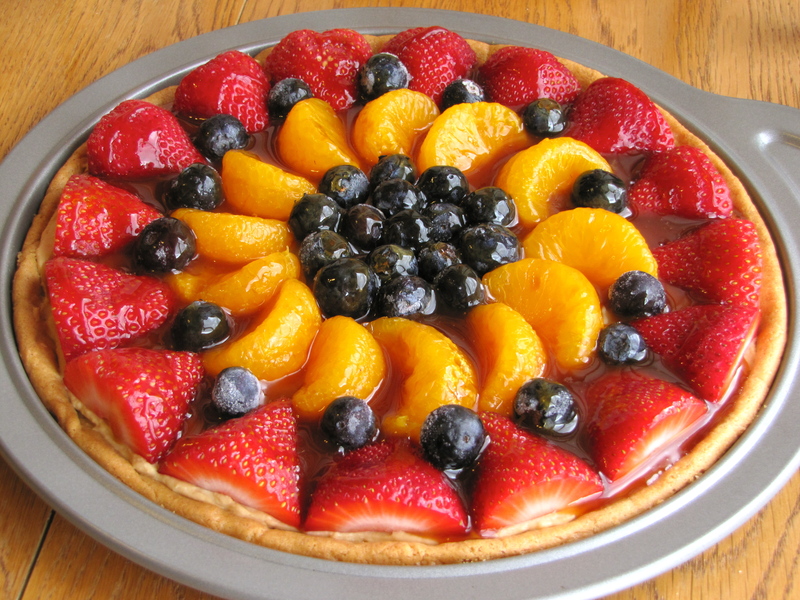 I made this today with cherries, raspberries and blueberries for 4th of July tomorrow…such a yummy festive dessert!